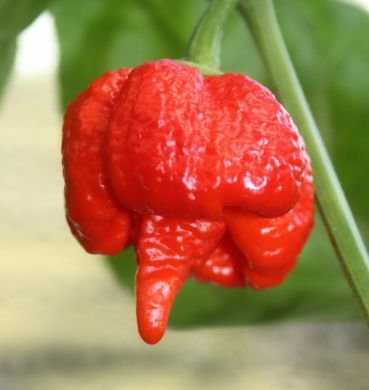 The Trinidad Scorpion powder or Trinidad Scorpion pepper has officially surpassed the Bhut Jolokia pepper as the hottest pepper in the world. In April 2011, the Trinidad Scorpion chile (chili) pepper was confirmed as the hottest chile (chili) pepper in the world by the Guinness World Book of Records. The Trinidad Scorpion chili powder is rated at 1,469,700 Scoville units. These hot peppers originate from a strain of chilies from Trinidad, an island in the Caribbean. And now the Trinidad Moruga Scorpion is above them all with a rating of more than 2 million Scoville Units. Buy Trinidad Moruga Scorpion here in Trinidad Scorpion Powder and dried pods.